This is my second year at "Chefs with Altitude", a yearly celebration sponsored by Swisshotel the Stamford, with Chefs cooking live, music, free flow cocktails, food and desserts! The location is unbeatable, on the rooftop of the hotel (well, how else would you be able to justify the name of the party! 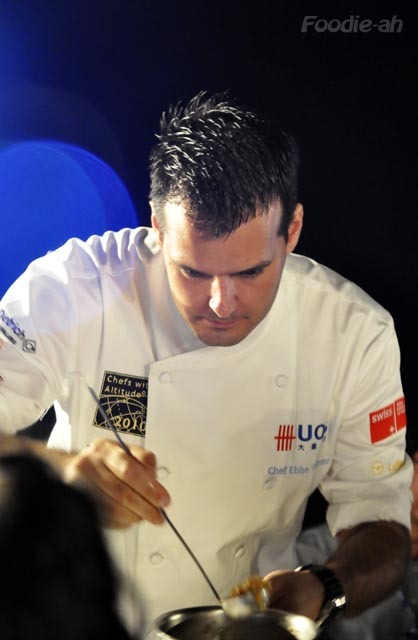 ), with a stunning view over Singapore and plenty of space for the Chefs to show off their culinary skills. I must say the party itself was as good as last year if not better, although the absence of Andre Chiang was definitely felt. The crowd was lively and the place was buzzing with people socialising, food and drinks constantly being dished out. 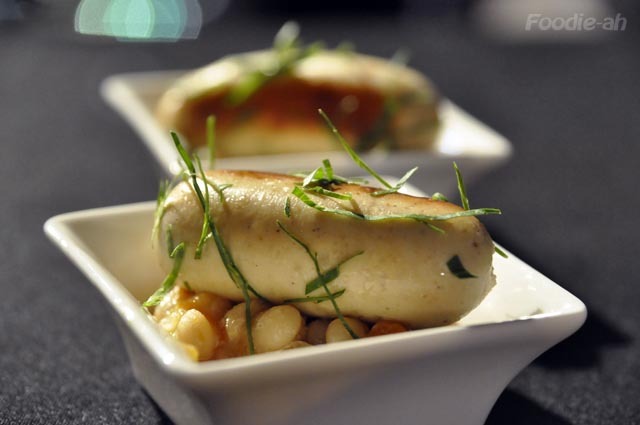 Ebbe Vollmer, the new resident Chef at Jaan, served a sausage with beans. Although there was nothing wrong with the dish, I wasn't particularly impressed since I am not a huge fan of either sausages or beans. 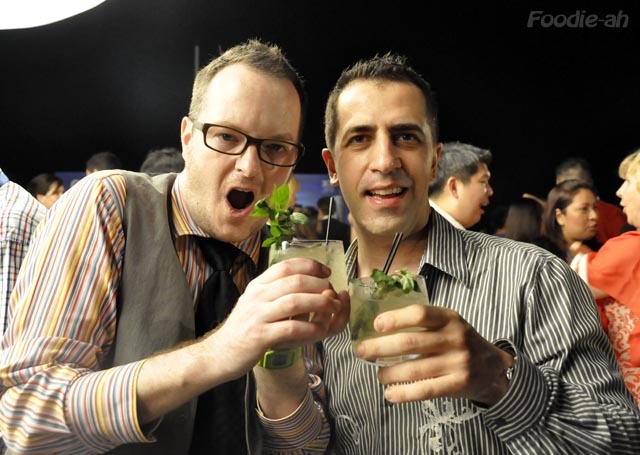 Just like last year, it was nice to taste delicacies and watching master Chefs at work while sipping beautiful cocktails. Overall the party was a success, and I will be looking forward to next year's event. This just reminded me that it's about time I go and try Jaan, now that Chef Ebbe is well settled in! To celebrate their 1st anniversary, Private affairs launched a special offer menu for the month of October, featuring 8 of their best dishes for S$88++. 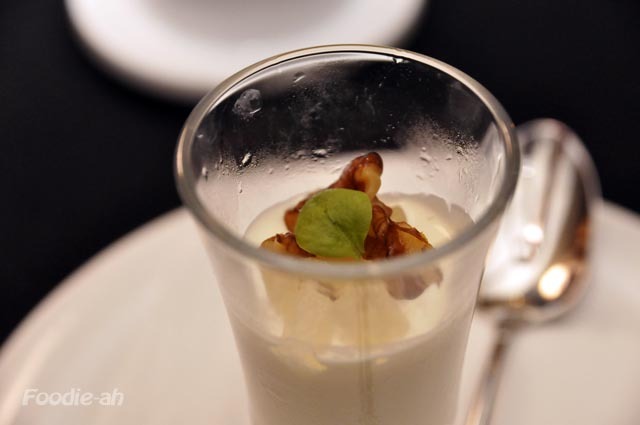 The amouse bouche was a creme fraiche with apple and walnuts. 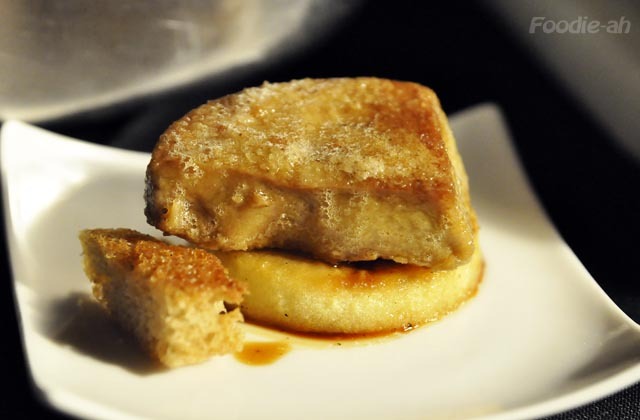 It's the kind of dish that will be appreciated by dairy products lovers. The Seared Tuna with red peppers and "sauce vierge" was tender and tasty, and offered a good contrast of sweet and sour. On the other hand, I didn't particularly appreciate the Raw Hokkaido Scallops, perhaps due to the fact that I prefer my scallops all in one piece. I find that once they are sliced into thin slices, they tend to lose their most attractive textural qualities. 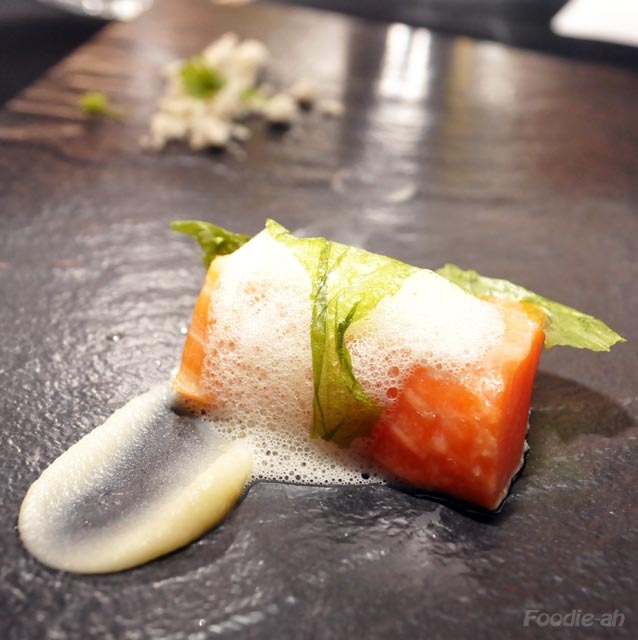 The Ocean Trout was accompanied by a garlic soil, a sea lettuce foam and a "salsify puree'". A pleasant melangee of flavours that enhanced the rich, tender and chunky trout meat. I didn't find that the garlic soil added much to the dish, besides its ornamental aspect, so I just left it aside. 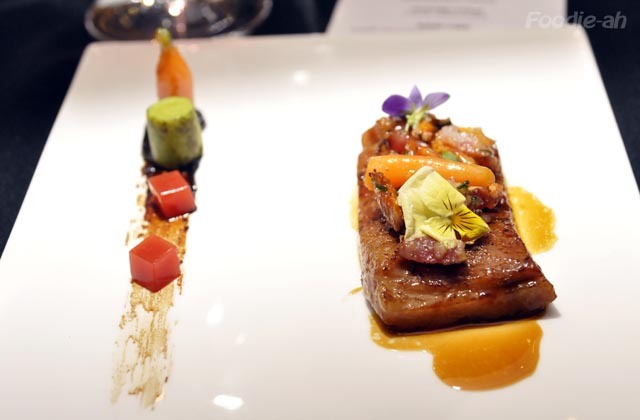 I was surprised by the Wagyu Cheek, which was unexpectedly chopped into cubes on a bed of diced vegetables (a sort of cooked vegetables salad). A good combination of flavours, where the crab on top of the meat didn't seem to emerge and was a little wasted. The Kurobuta Pork Cheek was the best dish of the night. 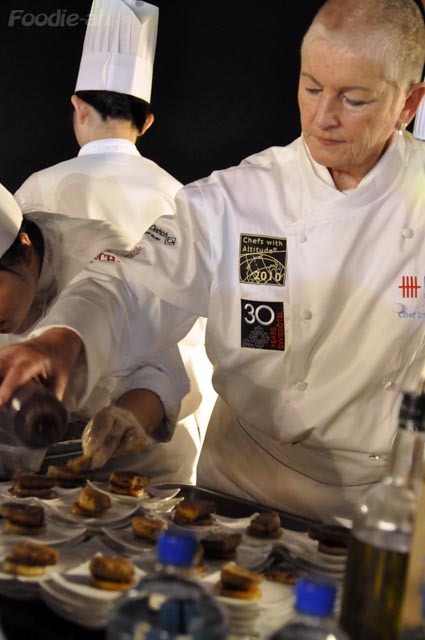 The cheek was cooked sous-vide and texturally unprecedented. 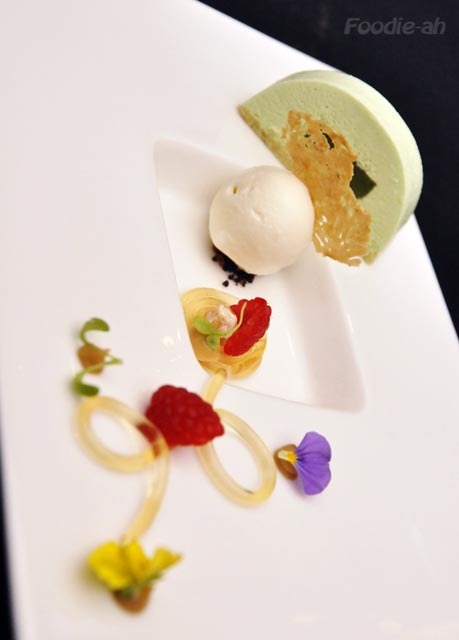 This is where flavour, textures and presentation really came together at their best. The final dessert, an Apple Cake, was the second best dish of the night. I really loved slurping the apple cinnamon spaghetti, but the highlight was the bit in the middle, which was a caramelised hazelnut with some fresh raspberry. The apple Bavarois was excellent both in texture and flavour, and the lemongrass ice cream was a wonderful palate cleanser. 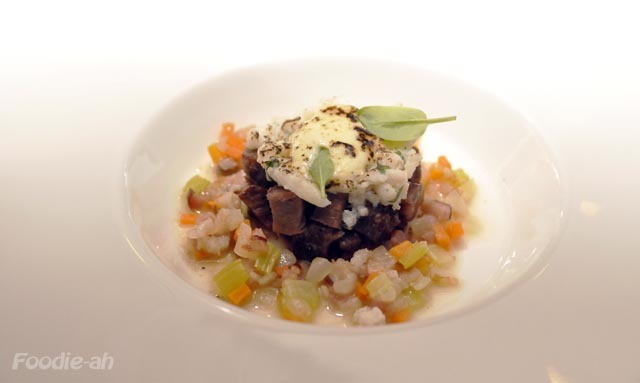 This selection offers an ideal opportunity for those who haven't yet had a chance to try the food at Private Affairs. My only observation is that the Hokkaido scallops could have been replaced with something that I believe Chef Paul is great at: soups with ravioli. That element was kind of missing and I think it would have made the course selection more complete. Nevertheless, I would recommend this great value deal before it's over. 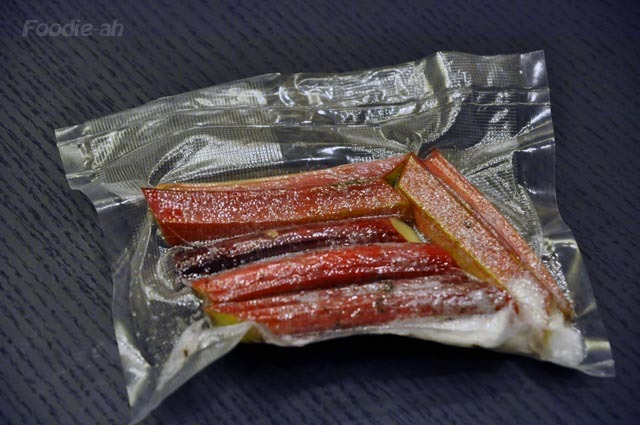 When I saw this beautiful rhubarb being sold at FairPrice in Marine Parade, I thought it would be a great opportunity to try it sous-vide. I appreciate the fact that FairPrice is actually making an effort to introduce foreign products that otherwise can hardly be found in Singapore. They are currently promoting rhubarb, celeriac, parsnips, artichokes, endives and a few others. I have never actually cooked rhubarb before, so this would be my first experience with it. I quickly did some research to find a recipe, and I found this one: 45 minutes at 61C. 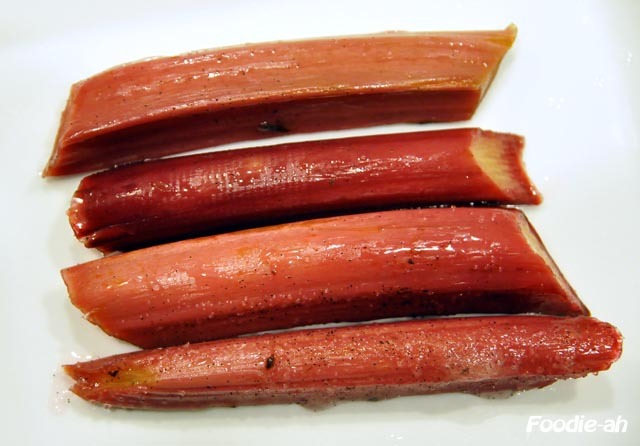 As in the recipe, I mixed some natural vanilla pods, about 130g rhubarb and 25g of sugar in a bag and vacuumed it dry. I only cooked it for 30 minutes, since this other recipe suggests cooking it at the same temperature for just 20 minutes, so I decided to average them out. The result was very tasty, especially with that natural and smooth vanilla flavour lingering in the background. Next time, I would try to cook it for 45 minutes, since I could tell that it would have tasted even better if softened a bit further. I finally decided to try a slow cooking dish with the new circulator. This was my first real attempt to cooking meat overnight, and I must say that I was incredibly happy with the result! The meat fell off the bone effortlessly, the skin was crispy and the sauce was rich and tasty. The marsala wine sauce added that Italian touch to the dish. 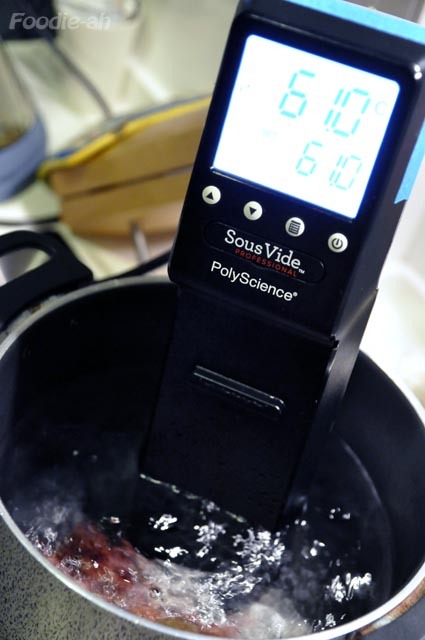 I am starting to really appreciate sous-vide cooking, since once you get into it and it becomes more natural, it's really a "set and forget" affair. I used pork belly on the bone, and I brined it for a couple of hours in a solution of 1l of water, 80gr salt and 30gr of sugar. It would have been better to brine it overnight, but I didn't have the time and I decided to take that shortcut this time. At least next time, when I will be doing it the proper way, I will know the difference. After brining the pork, I quickly washed and vacuum packed it together with a "herb sachet" containing black peppercorns and thyme. Herb sachets are used to let the aromas of the herbs circulate within the vacuum pack without entering in direct contact with the meat, therefore avoiding concentration of flavour at specific spots. I made my herb sachet by wrapping the herbs into a cling film, and then trimming the edges to let the liquid go through the sachet. I sealed the pork in a vacuum bag together with about 80ml of chicken stock. Finally, I slow-cooked the pork at 180F (82.2C) for 12 hours, then removed it from the water bath, chilled it and refrigerated. 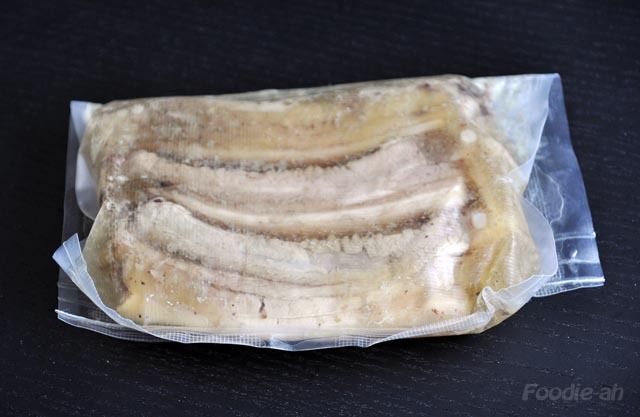 At the time of serving, I opened the pack and set aside the gelatin surrounding the meat (this forms during the slow cooking process followed by refrigeration). I removed the skin from each piece of belly and crisped it on a non-stick pan, skin side down (no added oil necessary) on high-heat. At the same time, on a normal stick metal pan, I browned each piece of pork on a thin film of canola oil. 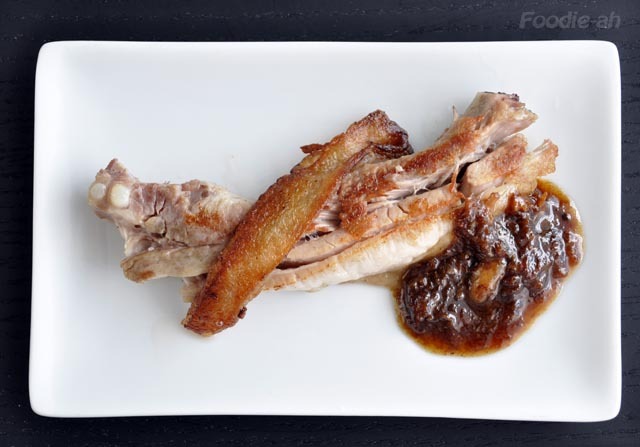 Once browned, I removed the pork and deglazed with a splash of Marsala wine (the Italian touch that does magic with pork! ), and once the alcohol evaporated I added the gelatin and another 40ml of chicken stock. I reduced the sauce over 4-5 minutes, then served it with the pork bellies, topped with their own crispy skin. Yet another version of my favourite combination: Campari and grapefruit. In this variation, I also used some yuzu marmelade, which you can buy in any cold storage (called "honey citron tea" on the label). 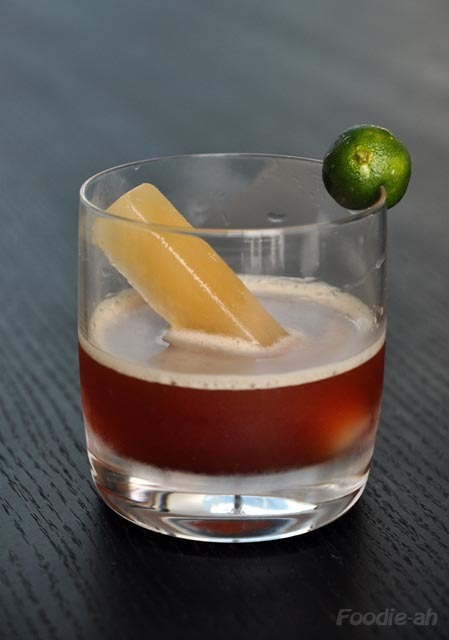 This is a tri-citrus drink which combines yuzu, lime and grapefruit: an extremely refreshing combination of sweet, sour and bitter. Freeze the grapefruit juice in an ice tray (I used this fancy 'long sticks' shaped tray). 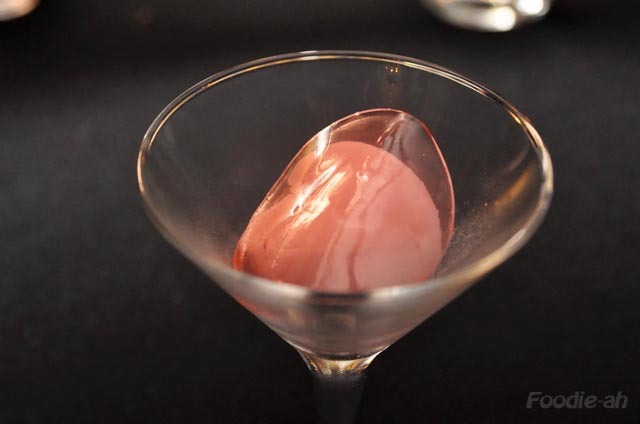 Mix 1 part of campari, 1 part of martini rosso, 1 tbsp of Yuzu marmelade, 1 part of water. Shake with lots of ice in a cocktail shaker, then serve and decorate with the lime and the grapefruit ice cubes.